Yes, this is nice to know! Thank you. Wing. I thing thanks goes out to Tammy who found it as well as Dennis and I think Tracy for helping outs. 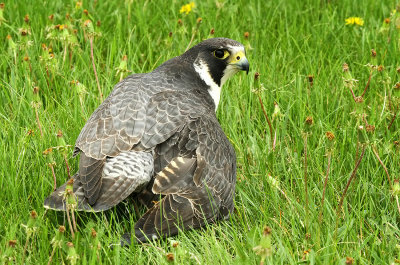 I am glad you were able to capture the injured peregrine, TPC. I hope the injury to the wing is not too serious, and that the bird will be okay. Please update when you can. When we know we'll be sure to post something here. Fingers crossed but broken bones can be difficult. Is this a banded falcon and if so, is there any identification? You just never know what the day will bring ? As I'm enjoying my morning coffee and read an email then a text that states an injured bird was found in the Selkirk area. My contact went on to say that it looked like a Peregrine ? After a couple texts and emails I received a photo of the injured bird along with an address and confirmed that it was in fact a Peregrine. Phone call to TPC and we met at the location. It took some time to locate the bird that had a very good hiding spot. Short time later the bird was in a carrier and on it's way from the Lockport area to Wildlife Haven Rehab Center. The bird was unbanded and we think that it may be a Tundra bird that was migrating through ? It appeared that the bird had a broken wing from what we could tell...will have to wait and see what the outcome is. no bands - pretty bird though. no news yet - often have to stabilize first before putting the bird through stress of a full vet exam and xrays. when I know something, I will post. Many thanks for going out to help rescue this beautiful peregrine, Dennis, and also for the photo and information. I am hoping for the best possible outcome for him/her. Thank you for the update, TPC. At least this little one was rescued. He/she would not have survived on the ground for very long, unable to fly or hunt and vulnerable to predators. Hope everything goes well. Have you heard anything about the rescued Selkirk peregrine, TPC?